Today, the United Kingdom is neither a member of the euro currency zone and monetary union, nor (like Ireland) the Schengen zone of free movement. The former means that the United Kingdom still has its own currency, the pound sterling, and the Bank of England controls British monetary policy. The latter means that the United Kingdom retains more control over its borders than even non-EU states like Switzerland and Norway (both party to the Schengen Agreement). Conservative prime minister David Cameron, of course, has barely defended the once much-touted renegotiation with the rest of the European Union, but it’s true that he won three notable concessions — first, the right to a ‘benefits brake’ if the country continues to draw large numbers of workers from the rest of the European Union; second, the right for any non-eurozone member-state to protest the effects of EU monetary policy upon such members; and, finally, the commitment that Great Britain would not be forced to sign up to ‘ever closer union.’ The latter, in substance, was a formal recognition of the so-called ‘multi-speed Europe,’ acknowledging that some core EU member-states may develop a tighter — and voluntary — political integration. Cameron’s victories might not swing the electorate, but surely they merit more than the efforts of Labour prime minister Harold Wilson, who won only minor concessions on New Zealand butter prior to the 1975 referendum on British membership in the European Economic Community (coming just three years after Tory prime minister Edward Heath secured British membership after two vetoes from the skeptical French president Charles De Gaulle). That referendum passed with over 67% of the vote, it’s worth noting, a far higher ‘Remain’ vote than is likely to emerge on June 23. Moreover, after the efforts of leaders like Conservative prime minister Margaret Thatcher and Labour prime minister Tony Blair, the United Kingdom has clawed back a ‘rebate’ of the funds that it sends to support the European Union, in recognition that the United Kingdom receives virtually none of the subsidies to the ‘Common Agricultural Policy,’ easily parodied as the fund that boosts surpluses of cheese mountains and wine lakes for France’s protected farmers, that still — in the 2010s! — consumes nearly 40% of the European Union’s budget. That rebate, along with the bespoke British relationship with the European Union, would all be up for debate in a post-Brexit world. A vote to leave the European Union might, as ‘Remain’ supporters argue, lower the value of the pound sterling by 15% or more. That would actually make British exports cheaper, at least in the short run, and it could go a long way to ameliorating what’s become a record-high trade deficit with the European Union. That’s actually a reason to vote ‘Leave,’ at first glance. Yet Germany, as it turns out, is the top destination for British exports. It’s followed closely by the United States, then The Netherlands, Switzerland, France, Ireland and then Belgium. As of 2014, that comprises 54% of all exports from the United Kingdom. So accessing the European single market will be an imperative mission if British voters do choose to leave the European Union on Thursday. ‘Remain’ proponents may be unduly alarmist about the prospect of Brexit, but they are right that the failure to secure continued British engagement in the single market would be a huge setback for the world’s fifth-largest economy. “Out! And into the world!” Brexit supporters argue. And it’s true that, for the future of British (and European trade), an entire world beckons that, for the the British, includes much of the Commonwealth. Trade with China, India and the rest of the word is great, of course. But when Indian prime minister Narendra Modi, elected on a sweeping landslide for reform, struggles to break down trade barriers between individual Indian states and to institute a harmonized goods and sales tax, it becomes clear that a landmark free trade accord with the United Kingdom would be even tougher. It’s the same in the United States, where an anxious Obama administration is already worried about the prospects of the Trans-Atlantic Trade and Investment Partnership, which promises to break down even non-tariff barriers between US and EU trade. TTIP will be difficult enough to implement under trade proponents Barack Obama or this year’s Democratic nominee Hillary Clinton. A separate deal with the United Kingdom would be even harder. It’s a testament to the growing middle class in the developing world that the ‘Leave’ campaign is looking to it for the British economy’s salvation, but it’s not credible that, say, Indian consumers will necessarily be able to pick up the slack of German consumers anytime soon. As the ‘Leave’ side contends, it’s incredible to believe that the European Union would refuse to work with Britain’s government to allow the country to access the single market. Even Turkey, after all, is in a customs union with the European Union. It might take years — note that it took three years to negotiate Greenland’s decision to leave the European Economic Community (for a far simpler economy) — but it would be in neither EU nor UK best interests to shun a deal, no matter how intransigent the French say they’ll be. And make no mistake, the governments of many of the remaining 27 member-states, including Germany and France, will have every incentive to make Britain’s exit from the European Union as painful a precedent as possible to stave off future efforts of member-states to leave, under the new infrastructure of Article 50 or otherwise. But even if the United Kingdom negotiates re-entry into the European single market, it risks the fate of two other European countries — Norway and Switzerland — that are both forced, to varying degrees, to accept the terms of EU regulation in exchange for access to the European market. In both cases, Norway and Switzerland must accept copious amounts of EU regulation, including those that follow from the principle of free movement of workers throughout the European single market, without any corresponding input on those regulations. In short, Great Britain could end up just like Norway and Switzerland — subject to EU diktat, but with no ability to influence the outcomes of EU policy debates. It’s true, as ‘Leave’ proponents argue, that the British might be able, due to the strength and size of their economy, to demand even better terms than the Swiss and the Norwegians. But to leave the European Union is a far different thing than never to have joined, and, even setting aside ruffled feelings, no one know just how incentivized the remaining 27 member-states of the European Union will be to make life difficult for the United Kingdom. At a minimum, Europeans could deny the British the ‘passporting’ rights that its financial industry would need to continue operations across the continent, dealing a blow to the city of London. While some in the U.K. see Norway’s looser relationship with the EU as a potential model for a post-Brexit Britain, Oslo sees a long list of drawbacks: losing influence in Brussels, being sidelined at meetings on defense policy, and having to accept EU rules in return for retaining access to the internal market. 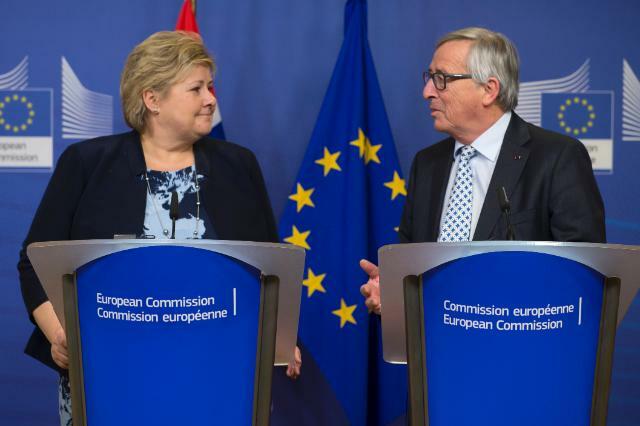 “That type of connection is going to be difficult for Britain, because then Brussels will decide without the Brits being able to participate in the decision-making,” said Solberg. Switzerland has a slightly different (and arguably better) deal with the European Union as a member of the European Free Trade Association (EFTA), formed in 1960 by the United Kingdom as an alternative free-trade bloc to the emerging European Economic Community. Today, EFTA includes just Switzerland and Iceland, Norway and Liechtenstein; in its heyday, however, it incorporated Denmark, Austria, Finland, Sweden and Portugal as well as the British. Still, the Swiss have to play by enough EU rules to place significant restraints on their policymaking. A defiant February 2014 referendum placing new limits on immigration to Switzerland from within the rest of the European Union violated its commitment to single market rules on the free movement of workers and, accordingly, if implemented, could endanger Swiss access to the market. Brexit at a time of synergies? Ironically, the Brexit vote comes at a time when Germany’s grand coalition government and even France’s unpopular leftist government essentially agree on economic policy with Cameron and his conservatives. Imagine telling Margaret Thatcher a quarter-century ago that a German chancellor would use a European financial crisis as an opportunity push through a fiscal compact that makes EU member-states take much more seriously limits to budget deficits and that backs up that policy directive with real enforcement mechanisms. She would have been quite happily surprised. The European Union’s gradual tilt toward fiscal responsibility is one of the reasons that leftists in the United Kingdom and beyond have grown less enthusiastic about the European project (Far-left Labour leader Jeremy Corbyn has been virtually invisible and, certainly, far from an enthusiastic ‘Remain’ supporter, in the current referendum debate). But even as Tory policy has converged with dominant EU economic policy, the ‘sovereignty’ argument continues to win votes — especially among voters who have disclaimed immigration as a motivation for leaving the European Union. It’s a principled and a thoughtful argument for Brexit. But it’s not entirely clear that the British will wind up with more sovereignty than they enjoy today.